Watch how incredibly easy it is to use the Hair Removal Laser 4X. Treat safely and confidently, just like a professional in the comfort of your home. You're one pulse away from smooth skin. After each pulse, lift and place the tip in an overlapping pattern. Download more detailed information on how to use the Hair Removal Laser 4X. Hair Removal Laser 4X embodies the beauty of technology at its best. Tired of ingrown hairs and bikini stubble? Our newest device, Hair Removal Laser Precision is designed for small, sensitive areas. Small, slender and light, Tria Laser Precision is great for all your curved areas. With enough battery charge to treat an area like both underarms, it’s ideal to take along on a vacation. 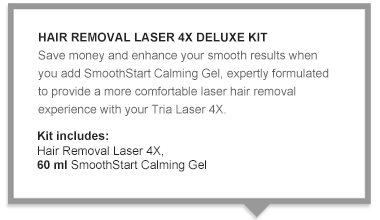 Can I use the Tria Hair Removal Laser 4X on my face? 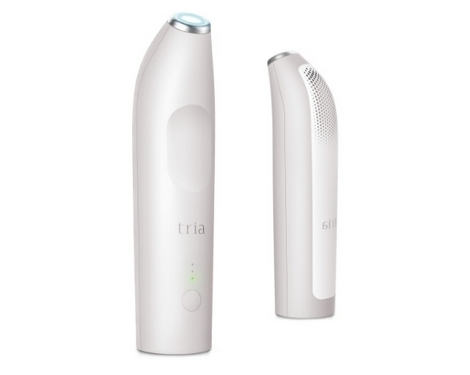 Yes, the Tria Laser 4X can be used on women's facial hair (cheek line downward). Men should not use it on their face due to the density of facial hair. Is my hair color suitable for using the Tria Hair Removal Laser 4X? Wipe your skin with a cool, damp cloth to remove any shaving cream or soap, and then dry the area well. Please note: Waxing and plucking are not advisable any time between treatments because both remove hair from the follicle. The hair inside the follicle needs to be present for the Hair Removal Laser 4X treatments to be effective. 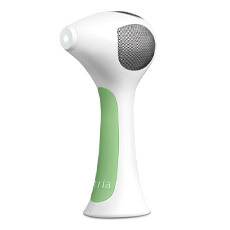 Can I use my Tria Hair Removal Laser 4X more often than every 2 weeks? We recommend treating every 2 weeks for best results. This treatment protocol is optimal to target the hair follicle at the proper stage of its growth cycle. For permanent results, treat the area once every 2 weeks for at least 3 months, or until desired result has been reached.